We have a new Brexit deadline: 31 October 2019. This extends the Brexit voyage. No Brexit: the UK remains in the EU either as a result of a referendum or a political decision to revoke the article 50 process. Right now, however, the UK remains in the ‘doldrums’, to use a nautical term. The UK political system is deadlocked, unable to agree on anything and unable to move forward towards any of these destinations. This remains unchanged for now and means that we should not expect rapid progress in the coming months. The last few months have shown that any political movement in one direction tends to prompt an equal and opposite reaction which pulls the debate in the other direction. 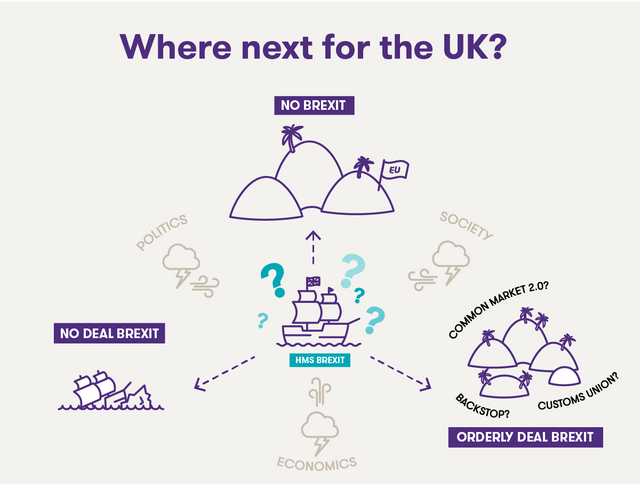 The extended Brexit deadline does create a new dynamic, as it ushers in greater political volatility that could whip up a storm that blows the UK towards a final destination. My colleague Tom Rathborn has set out in another blog how the extended Brexit deadline increases the risk of political volatility. You can read his blog here. Political change in the UK could have as significant impact on the UK business environment as Brexit. If politicians are unable to agree on a way forward on Brexit, we will continue to see endless debates in Parliament with no final outcome. Even if MPs approve the Withdrawal Agreement in principle, we will see continued debate about the draft bill that turns it into UK law; and we will see continued debate and divisions within political parties and in parliament on what sort of future relationship the UK should negotiate with the EU and with the rest of the world. This will create a period of continued uncertainty over much of the next year. We can expect a subdued UK economy and subdued investment. Over recent months we have seen an easing in new deal activity and, whilst ongoing M&A transactions are continuing to close, it is clear that some investment decisions are being postponed. We can expect ongoing uncertainty to continue this delay in investment. Consumer confidence may also be dampened. The labour market may continue to tighten as EU immigration continues to reduce and many people choose to stick with their current jobs in the face of uncertainty. Some businesses in the supply chain may be distressed as no-deal stockpiling followed by subdued demand may stretch cashflow. If this groundhog day ever ends, it could be in the shape of either a no-deal or an orderly transition unless political change blows us towards a second referendum and that referendum takes a decision to remain in the EU. No Transition: the UK leaves the EU with few agreements in place to replace existing arrangements on trade. UK leaves Customs Union and trades on WTO terms with the EU: EU-UK trade in goods is subject to external tariffs and customs declarations. The UK would introduce new external tariffs (further information here). UK leaves the single market: EU recognition of UK regulatory regimes and standards ceases. There is no automatic access to the EU market for UK goods and services. Free movement of people ends: no automatic right to work or do business except for those already in place; EU health and social security agreements with the UK end. Different immigration rules in each country for UK citizens. It would create disruption to supply chains, trade barriers in EU markets, longer-term costs to all businesses and economic downturn in the UK. The International Monetary Fund (IMF) has recently forecast that a no-deal Brexit would push the UK into a recession, with growth declining by 3.5% over two years. Bank of England stress test modelling estimates 6.5% inflation and a 25% fall in sterling, to below parity with US $. In the first weeks and months of a no-deal Brexit, there may be delays with goods being held up at ports or EU borders as a result of new customs checks and initial chaos. Dover and Folkestone are expected to be pinch points due to the high volume of traffic. Over the medium term, increased costs would include tariffs, customs administration, new regulatory compliance costs in EU, labour market inflation and foreign exchange impact. If Parliament ratifies the withdrawal agreement negotiated between the EU and UK, it provides for a further transition period during which a future EU-UK trading relationship is negotiated and UK trade deals with third countries can begin to be negotiated. This future relationship may be the type of Free Trade Agreement set out in the current political declaration agreed by the UK government and the EU (more details here) or it may include a customs union (more on this here). a transition period to 31 December 2020 during which access to markets, programmes and regulatory regimes will remain largely unchanged. This can be extended for another two years to December 2022.
a guarantee of a permanent open border between Ireland and Northern Ireland. If needs be this will be achieved by the whole of the UK staying in the EU customs union after the end of the transition period; this is what is known as the ‘backstop’ which will only come into effect if the UK and EU have not reached an agreement on their future trading relationship in a way that maintains an open border. Following on from that, a further series of trade deals and agreements over a period of five to ten years will gradually transition the UK to its new place in the world. The Withdrawal Agreement does not provide a legal basis for the UK’s permanent, longer-term relationship with the EU, this will be negotiated during the transition period (this EU-UK trade agreement is unlikely to be finalised before 2021 at the earliest. During the transition period the UK will also be free to negotiate trade deals with other counties, such as the USA or China, although these would not be able to come into force until after the transition. In practice, these third country trade negotiations may need to wait until after the UK has agreed its trade deal with the EU, as the terms of any future relationship with the EU may determine what is negotiable. During transition, talks on the future relationship between the UK and EU could break down and could lead to a WTO based Brexit, similar to no-deal. Equally talks could take a very long time and lead to an ongoing period of uncertainty – with ‘doldrums’ become an extended norm in British politics. How can you navigate through this? press on with strategies to exploit the opportunities this disruption creates. More on these tips here. 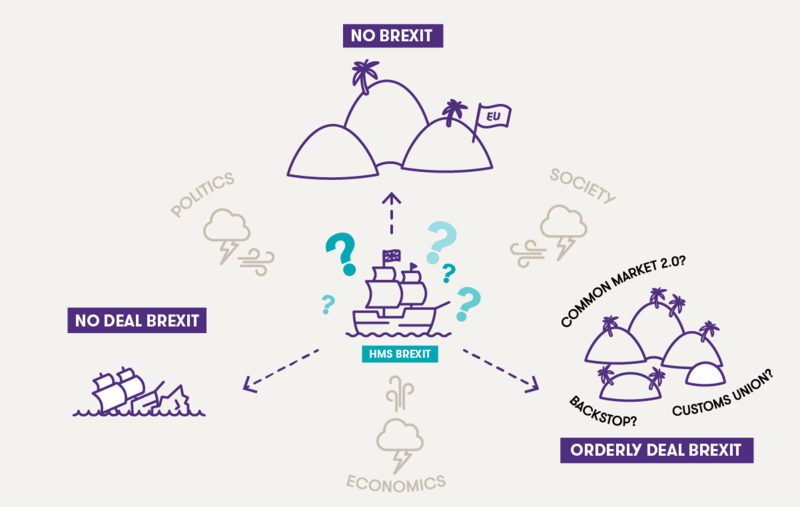 Welcome to Chapter Two of Brexit: continued political uncertainty and a range of possible outcomes! We have a new Brexit deadline: 31 October 2019. This extends the Brexit voyage. What it does not do is change the possible destinations. These remain a no-deal Brexit, Brexit with a deal or No Brexit. Right now, however, the UK remains in the ‘doldrums’. The UK political system is deadlocked, unable to agree on anything and unable to move forward towards any of these destinations. Our deputy political editor @BethRigby says a Brexit extension to 31 October might be a "little bit of a relief" for Theresa May, but says that the route out of the "Brexit nightmare is still really unclear"